Akureyri, the northern Icelandic capital, is Iceland’s second largest city. If you get there after spending several days in the desolate land, moving from a tiny fishing village to another, it can also give you the illusion of being a small, full-hearted metropolis animated by some mundane life, despite the 18,000 inhabitants. Akureyri is not particularly beautiful or, at least, does not have that strong personality that is felt walking through the streets of Reykjavík. However, maybe thanks to the delicious dinner with a stunning harbour view through the large glazing of the Strikid, during which the eyes of mister were illuminated at the mooring of each fishing boat with the inscription “Whale watching” on the wall (a sign of what we would have done – again – the next day); Or for the beautiful sunny day that accompanied our walk up to the botanic garden or to the gentle gesture of a woman who gave us parking and disco time to avoid a fine, to me Akureyri loved it. Remember my parts, there are several good reasons to reach the small town of the north: It is an excellent starting point for a tour of Diamond Circle, It is located in the ideal area to do whale watching and can be considered as the point of arrival of an alternative itinerary that touches the northwest part of the country, passing through the peninsula of Snæfellsnes. A beautiful black sand beach to which you will reach the road 572, which crosses a suggestive lava field. Here are the stones of the lifting, used in the past to test the strength of the aspiring fishermen: the lightest weighs 23 kilos and I did not manage to lift that. The beach is very suggestive for the pinnacles of solidified lava that surround it in contrast with the white hood of the volcano Snaefellsjokull. The inverted cone-shaped mount, visible from the port alone, is a great reason to get down here. In the middle of a lava field, you will find the leading manufacturer of Hákarl Of all Iceland and its museum. What is vulgarly translated as a shark putrefied is shark meat subjected to a long fermentation process that guarantees its edible and preservation.. All in all the taste is not so disgusting! The sacred mountain where, according to the Icelandic sagas, lived the heroine Guðrún Ósvífrsdóttir. 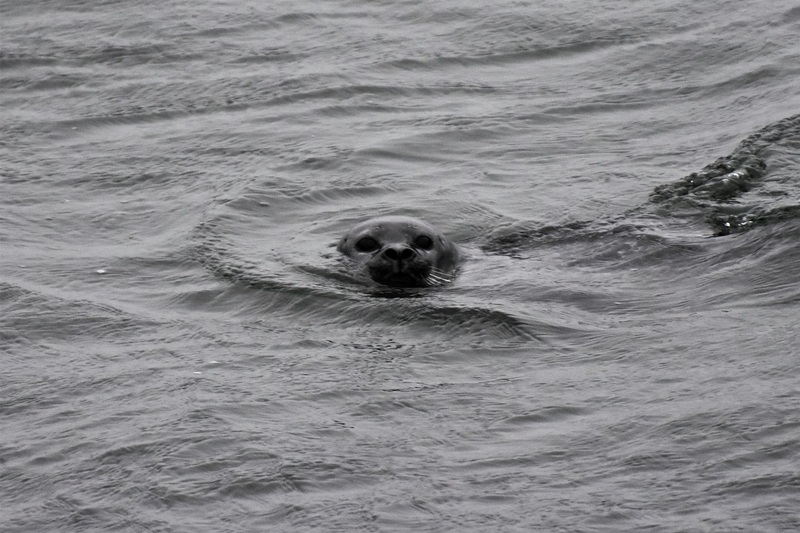 Even today the locals attribute to helgafell the power to make the dreams come true to whoever rises. 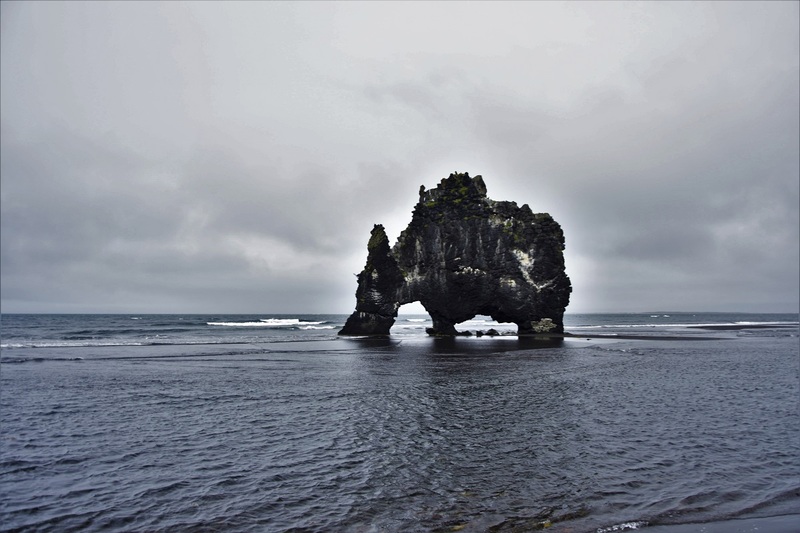 We are located a few kilometers from Stykkishólmur, an area that I loved for the endless lava fields on one side and the succession of lagoons and coffins on the other, in whose waters it is not difficult to see in the distance the wreck of some fishing boat. Abandon the comfortable ring for the 711, unpaved and rather tortuous it is really worth it both for the large colony of seals that camouflages between the black sand and for Hvítserkur, the Faraglione 15 meters high which, thanks to the particular shape, looks like a big dragon bent towards the sea to water. 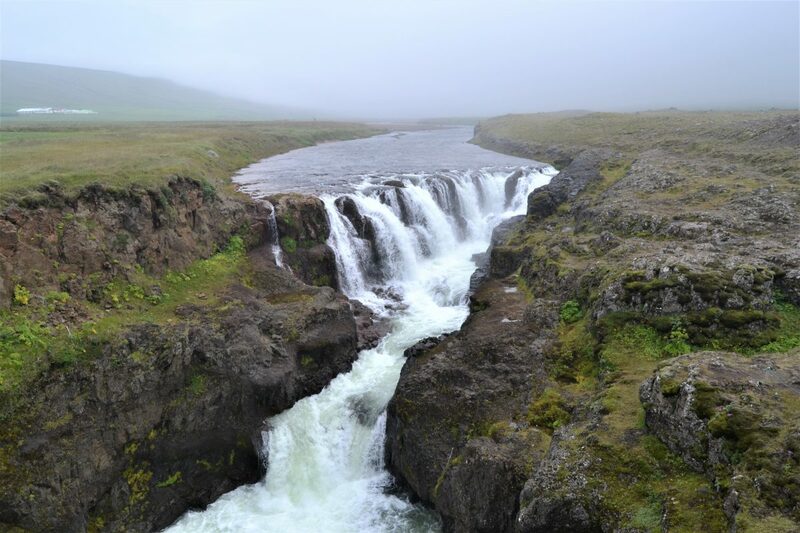 If you are in abstinence of waterfalls, you can make a short detour on the 715 to take some photos to this that is born from the river Víðidalsá: In the picture appears much smaller and placid than the reality, but still do not expect anything upsetting. It is a fishing village located at the apex of the fjord that bears the same name, reachable from Akureyri through a series of tunnels to a lane [Strada 76]: The thing may seem absurd, but the visibility is so good that you have all the time to pull in the nearest parking area in order to give precedence to those who come from the other direction. Siglufjörður is a colorful hamlet gathered around the marina with a couple of restaurants/pubs that until half a century ago was reachable only either by sea or by land on horseback (or on foot, of course). It was a very pleasant stopover and in the end we decided to stop to eat something sitting at an outdoor table, given the beautiful sunny day. 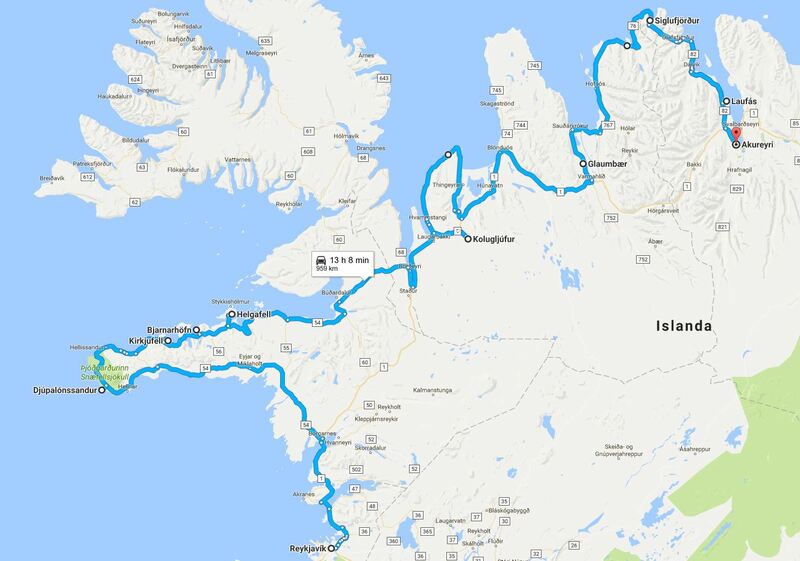 But be careful because you might approach a blond girl aboard a pink bike who will insist on telling you that Icelandic is not a difficult language, just repeat what she says. 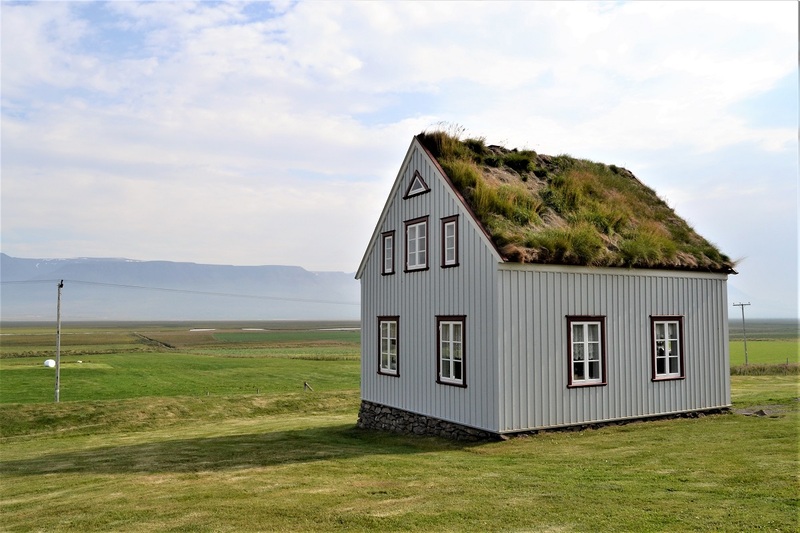 Among the various things that in Iceland have piqued my curiosity there are definitely the Torfbæir, that is, the picturesque houses of peat typical of the northern European countries covered by a turf, a perfect natural insulator against the cold and the wind. Over the centuries, the Torfbæir They have undergone a series of evolutions in form, but the construction technique has always remained the same: they consist of a wooden structure, a peat coating for the walls and roofs, with stones randomly assembled between the walls themselves. 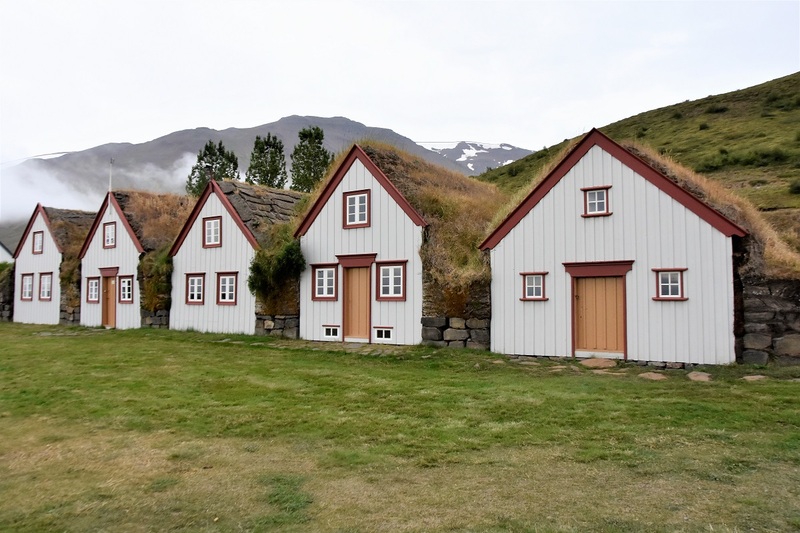 Unlike other countries, however, in Iceland this construction technique has not been applied only to dwellings – without distinction of class – but also to churches and buildings. The oldest buildings of this large farm date back to the mid-18th century, while the newer additional units were built around 1879. Overall, the site has 13 units, between dwellings and technical premises. The farm was inhabited up to a maximum of 25 people at the same time, including the pastor of the nearby church and his family, plus various workers and attendants. The oldest part of this farm dates back to 1840 and over the years has hosted up to 30 people and its main feature is the bride’s room, where the woman on duty was preparing for the big event.